For many freelancers, using social media platforms to find leads is something of a foreign concept. However, social media - especially Twitter - is a great place to attract more clients and grow your business. Not sure exactly how to use Twitter to promote your business? We’ve got you covered. Twitter currently has upwards of 330 million users, making the platform the prime place to connect with other freelancers and find potential clients. However, you may be wondering how exactly to take your social media account from something you occasionally browse through and use to chat with friends to a platform where you actively promote your business and find new clients. These days, Twitter is largely used as a networking and marketing tool. Follow our tips below to see how you can make the most of this opportunity. First things first, you need to optimise your profile before you start connecting with others. Secondly, you should get into the habit of actually usingTwitter. Use the platform to showcase your knowledge in your industry and really show your followers (and potential clients!) that you are an expert. Many marketing professionals recommend following the 80/20 rule: sharing 80% of others content (by retweeting and sharing articles/things you find interesting and industry news) and 20% your own content (blog posts, sales tweets etc.). 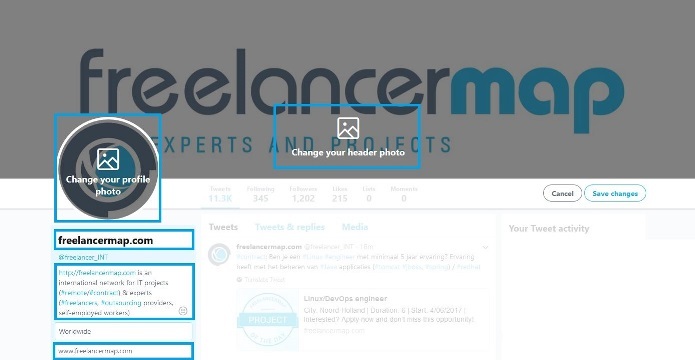 Twitter is a fantastic platform to find other freelancers and potential future clients with whom you can network, as you can connect with anyone who has a Twitter profile (i.e. you don’t need to request them as a friend or connection before you can reach out to them!). Follow people in your industry and connect with them by getting involved in Twitter chats and commenting on their Tweets. Building up these connections can be extremely valuable when you are looking for work in the future. Many businesses will post on Twitter when they are looking for a freelancer. Make use of this knowledge by using Twitter’s search features to find opportunities as they arise. It’s useful to note that competition will be high, so finding jobs that have been posted very recently will boost your chances of winning that pitch before the client is overwhelmed with messages! If you are, for example, a web designer, use the search tool and enter ‘web designer needed’ or ‘web designer job’ to find potential jobs. Likewise, using hashtags such as #WebDesignerRequired or #FreelanceWebDesigner can be effective ways of finding job opportunities on Twitter. Getting a lot of followers on Twitter is relatively achievable for anyone - the real challenge, though? Finding followers on Twitter that are actually interested in you and your business. To use Twitter to find clients, you want to attract followers that are interested in what you have to say and the services you offer. The best way to do this is to make sure you are following influencers in your industry, and engaging in their posts and conversations regularly. The more frequently your name appears in relevant discussions, the more likely people will click on your profile and follow you because they recognise youas an influencer in your niche as well. A great way to use Twitter to find clients is to be creative and find hidden opportunities. For example, in your searches you may find someone asking a lot of questions about your field, or commenting that they could really use some help with something in particular. While this isn’t explicitly a job vacancy, it is definitely an opportunity for you to open a dialogue and reach out to that person. Even offering a suggestion, and maybe linking to your website with an offer to help them in the future can be a great first introduction into finding a genuine, long-term client. The most important thing to remember when it comes to using Twitter to find clients is to be consistent, establish yourself as an authority in your niche, and to network with others in your industry. Social media is an amazing tool to connect with people from all over the world, opening up opportunities you never would have even heard of before. Take advantage of this and stay active and up-to-date with the trends and people that are online, and you’ll find more clients coming directly to you than ever before. Yasmin Purnell is a content creator at freelancermap.com. She has a great deal of experience working as a freelance copywriter and has enjoyed the Digital Nomad lifestyle. She is in charge of bringing you amazing freelancing tips and experiences that will help you boost your freelance business. Sensacional esse artigo. Imediatamente acionei minha conta no twiterr que estva paralisada pois eu não tinha idéia de como utilizá-la para alavancar meu negócio. Obrigado Yasmin pelas dicas valiosas. Abraços.